The mobile app surge has given CMOs a near instantaneous way to engage consumers 24/7, wherever they are. Yet the cost of mobile app development, and the scarcity of qualified developers, is sending shivers down the spines of enterprise leaders. CMOs, in particular, are under a great deal of pressure because of this, working under a limited budget, with executives demanding ROI from their mobile strategy. Still, CMOs need not pull their hair out. These tips can help marketers enable a successful mobile app strategy for their business and keep the higher-ups happy. Quality developers are expensive and may run development costs into hundreds of thousands. App idea may get “lost in translation”, when transferred to developers, and result in a sub-par user experience. Translating the requirements can also slow down app iterations and time-to-market. 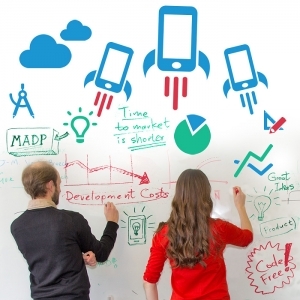 Initial app development may drain the mobile budget, and changes result in additional costs. App management and upgrades may drive up the long-term costs. The rise of mobile app development platforms (MADP), however, is quickly changing the game for enterprise leaders. The average mobile user spends 30 hours per month in apps. Most marketers, being digitally-savvy, probably spend more. They are, therefore, likely to have a good understanding of mobile UI and user experience. Graphic designers usually report to the marketing department. We have seen how, with proper guidance and code-free MADP solutions, graphic designers and business leaders can create great-looking apps that provide precisely what the customers need. If you want to provide superior mobile user experience, it makes sense to build more than one app. Target a specific audience with a specific use case – optimize your scenario for streamlined experience and 100% user satisfaction. With a flexible MADP solution, you can quickly prototype and test such targeted apps before you spend a dime on developers. MADP also enables CMOs and marketing leaders to reduce the long-term cost of app management and upgrades. Living on the cloud, a MADP can be accessed by assigned roles to update app content, push new versions, and prototype new functions in existing apps. Costs are minimal, and time-to-market is shorter than ever! Your apps will not bring ROI if your customers use them rarely, or delete them quickly. However, with a one-off custom development approach, continuous testing and change management can be challenging. Agile, code-free MADP for CMOs can serve as a great app testing and change management tool – reducing the total cost of ownership and greatly speeding up app iterations. These days, mobile apps have to be nimble – just like anything else in marketing! With the advent of cloud-based MADP solutions, CMOs are becoming the new force in mobile app development. With superior customer knowledge and cloud app platforms, marketers are clearly the ones best positioned to maximize ROI with useful mobile resources. These tactics can ensure a successful mobile app strategy and deliver some nice job security in the process.